Have you ever considered the weather when booking your surgery abroad? We want you to be fully informed about all aspects of your trip to Beauty in Prague. 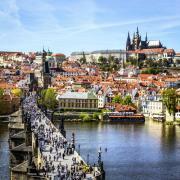 The city of Prague lies between oceanic climate and humid continental climate. The winters are relatively cold with average temperatures at about freezing point, and with very little sunshine. Snow cover can be common between mid-November to late March.The driest season is usually winter while the summers can bring quite heavy rain especially in form of violent storms and showers.